Listing 20-4 shows a procedure that is located in a VBA module in a Word 2003 document. This procedure creates an Excel Worksheet object —whose moniker is "Excel.Sheet" — from an existing workbook. 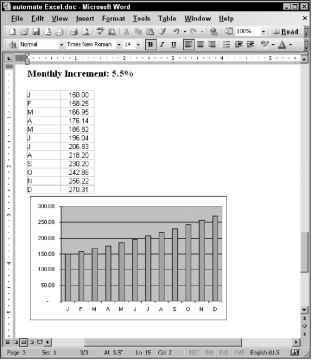 Wbook = ThisDocument.Path & "\projections.xls"
The initial workbook is shown in Figure 20-8. 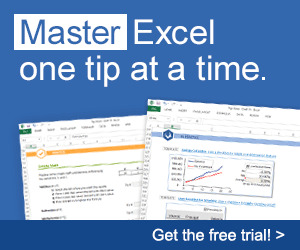 The MakeExcelChart procedure prompts the user for two values and inserts the values into the worksheet. Recalculating the worksheet updates a chart. 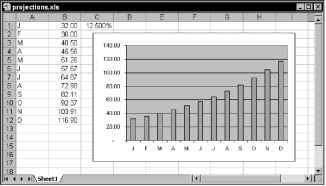 The data and the chart are then copied from the Excel object and pasted into a new document. The results are shown in Figure 20-9. Figure 20-8: A VBA procedure in Word uses this worksheet. Figure 20-9: The Word VBA procedure uses Excel to create this document.